Our Ridley boy is two. How this happened? I still don't know. Since his birthday is two days before Valentine's Day and he loves dogs, the theme for his party this year was "Puppy Love." I had so much fun planning the details and tried to keep everything very low key yet fun for the kids. The color pallete was simple - red, white, yellow, and dark brown. Ridley has this really cute John John with an appliqued puppy dog and we used that as inspiration for his party package which includes an invitation, banner, food labels, gift bag labels, and a coloring page. Our guest list for this party included our extended family and a few close friends who had children Ridley's age and older siblings for the girls to play with. We held the party in our playroom (pictures coming soon of this recent before-and-after project!) and the weather was so nice that guests could sit on the back patio too. Activities for the kids included a Valentine cookie decorating station, coloring pages, and a play puppy station. I had ordered some mini heart shaped balloons that the little kids had fun playing with and the big kids enjoyed getting to run around outside. Simple, simple, simple! 1/2 package Valentine's chocolate m & m's. Divide chex mix into two separate bowls. Melt half the white chocolate/almond bark and the shortening and pour into one bowl of Chex mix. Coat the Chex mix with the almond bark and then dump into a ziplock bag. Mix together have the powdered sugar and the strawberry cake mix together and then pour into the ziplock bag. Shake the Chex mix so it is covered with the sugar/cake mix. Next, melt the remainder chocolate bark with the candy melts and pour into second bowl of Chex mix. Coat the Chex mis with the melted chocoate and pour into a ziplock bag. Use the remainder of your powdered sugar to cover the Chex Mix. Pour half of both bags into bowl and sprinkle Valentine's m&m's on top. Munch and enjoy! I found cute paper products at Michael's for his party that went with our Valentine's theme and bought balloons and candles from TomKat studio. I bought a heart rug for the entry of my playroom and dog bowls to serve the food in at Target and had the Artist Tree make me a Valentine's Day door hanger. To get clever with the dog theme, we gave Ridley's guests bouncy balls that I found at The Dollar Tree with the saying, "We had a ball! Thanks for coming to Ridley's 2nd Birthday Party." It was super cute and a very inexpensive gift! Being Ridley's mom is such a treat and I really enjoyed getting to celebrate his second birthday with our family and friends. As a party planning mama, sometimes I let the details and the work of planning a party exhaust me. Keeping everything simple and the guest list minimal really helped me enjoy the party. Now that we have a two year old in our lives, he is communicating with his favorite words: "mama" "whoa!" "dog," "woof, woof," "no," and "tur-tle." He loves watching Ninja Turtles, chasing his sisters, and eating anything we put in front of him. He's transitioned recently into a toddler bed yet his faded blue blanket still follows him everywhere he goes. Ridley is also beginning to potty train and has started attending the same school as the girls. He's all boy but he sure does love his sisters. 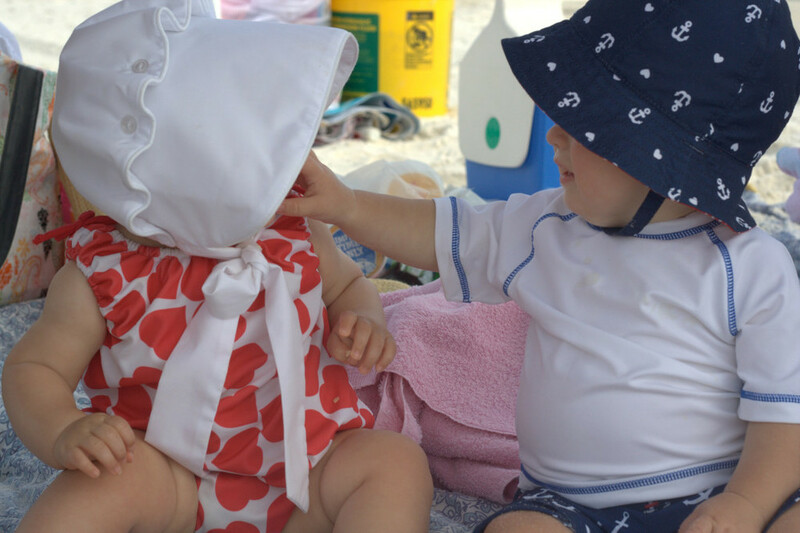 I can't help but let them tackle one another with hugs and kisses when it is time to pick them up. Ridley weighs 28.5 pounds and is 35 inches tall. Ridley is still my baby but he's growing into a little boy. I love his full-on kisses, high-pitched laugh, and white-blonde hair more than I ever thought possible. Even though I know the toddler years are going to be full of meltdowns and challenges, I'm trying my best to savor the sweet moments that make life with children so very special. Celebrating his birthday was one way for us to rejoice in the life of our boy and I'm so thankful for everyone that joined us. To see more party packages and printables, head on over to our Etsy shop. You can also follow my "Fun Party Ideas" board on Pinterest for more inspiration! Since Ridley has turned one, he has slowly changed from baby to boy. Instead of his usual scoot-crawl, he began to pull up. Pulling up led to a few timid steps and a big smile once he reached my arms. Soon, his little body was able to stay upright and his feet got a little more courageous. Now, at fifteen months, he hangs with the big kids, walking and giggling up and down our halls like a pro. With his new walking skills, he's gotten way more adventurous. He thinks the toilet paper in the bathroom is a means for an epic celebration and the sippy cups in the kitchen drawer need to be constantly re-arranged. He totters from this room to that, exploring and touching and smiling adorably every time he gets caught. Another boy-like trait that he continues to develop is his love for food. 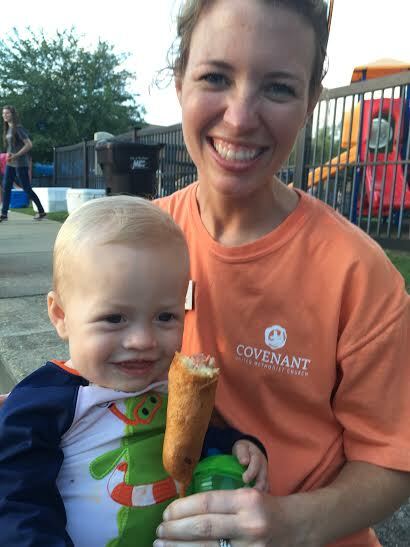 Just this past Sunday, the child ate one and half corndogs at CovFest. And he wanted more! Whatever we are eating, he wants a bite and when he finds something he likes, he does this bootie-scoot and laughs. Even though he can't talk, he is saying, "Mom, this is delicious!" With him being the third child, he naturally goes where we all go. Whether it is the pool or the beach, gymnastics or church, he is right there with us, doing his thing. He is a mess and I find myself having to keep him clean, not only at home but also on-the-go. So, when I got a message that Huggies wanted me to try out their New and Improved Triple Clean Layers at Wal-Mart, I was in. What mom doesn't need wipes? 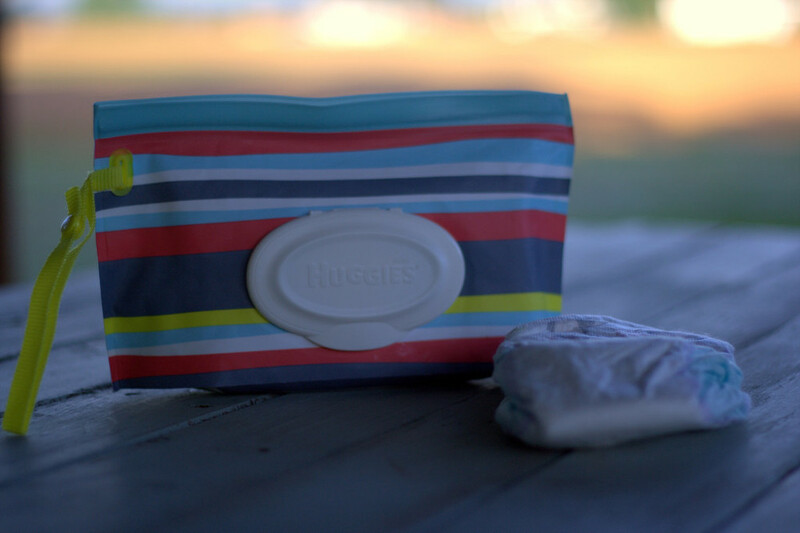 I like to use Huggies Natural Care wipes for our little man at home. When I went to purchase the wipes, I got some refills so I could have plenty of wipes and then the Pop-Up Tub to store the wipes that I use at his changing table. 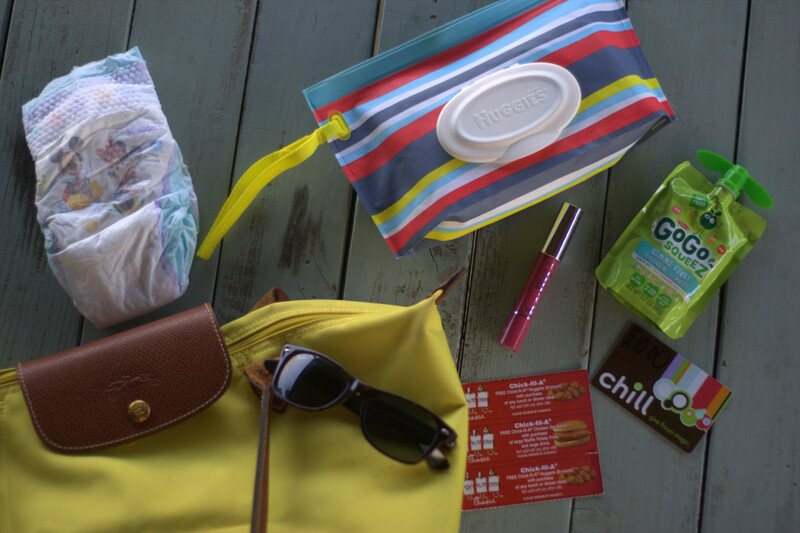 Then, I put some of the refills in this super cute Clutch 'n' Clean bag in my purse. I carry these with me everywhere! 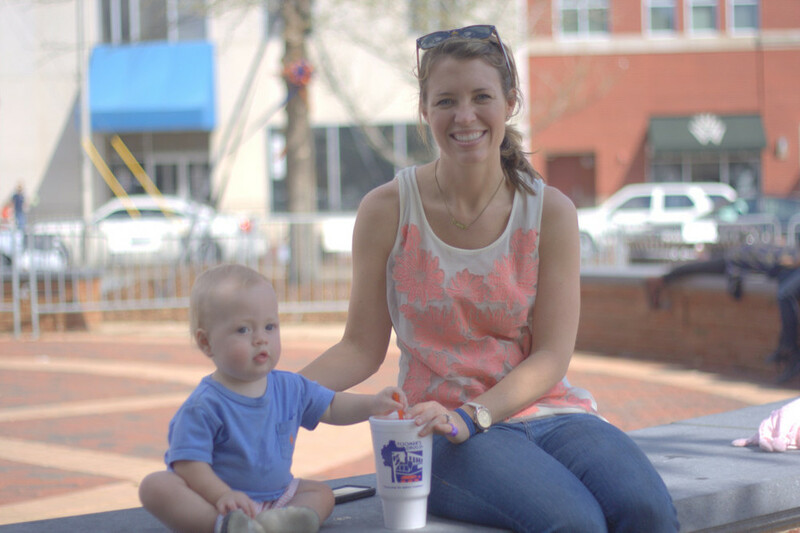 When we are on-the-go, I usually try to carry diapers, wipes, snacks, and drinks to keep my kids clean and full. This summer, we are going to be all over the place - the beach, the pool, and the park - so I'm constantly keeping all the necessities on hand. Just this past Monday, we went to the park with a friend and I used the wipes in my Clutch 'n' Clean to get the dirt off his hands before he ate, wipe the sweat off his face from playing in the heat, and also used the wipes to clean his sippy cup every time it fell to the ground as he chased his sisters on the playground. Now that Ridley is walking, our family is even busier than we were before.With that busyness comes mess that has to be cleaned up. Whenever I get tired of cleaning or going or doing I just remind myself that this is the stage of life that we are in right now and getting overwhelmed with it all does nobody any good. Instead, I take a moment to pause and soak up everything I love about this season of life. As I watch him chase his sisters in just a diaper after the rain, I am keenly aware that he is growing from baby to boy right in front of my eyes. Because kids outgrow diapers, and not messes*, I know that soon he is going to be digging up dirt, playing with trucks and going on even more adventures. So, yeah, my baby boy is not such a baby anymore. A little over a month ago, he turned one. Since then, he's gotten four new teeth and has discovered the awesomeness of toilet paper. He just laughs and looks at me like, "What? I can't help it if the paper keeps coming when I pull." Oh, and he's definitely got a sweet tooth. Just this past Sunday, he made all sorts of noises until I shared my Reese's egg with him. I'll give him credit though, I'd be making all sorts of funny noises if someone didn't share a Reese's egg with me too. Anyway, I can't believe he's already one. And I'm sad to say that I'm just now sharing this, almost two months later. But, he's the baby and life is always moving so I'm not going to feel guilty. Hope you enjoy! Happy birthday, sweet Ridley boy. You've made me understand this past year what the term "mama's boy" really means. I've always considered the term to be directed toward the child, how boys need their moms more than girls do. But ever since I heard you cry, you've been the child that I've loved in a way that my heart still can't put words toward. Maybe it's because you were born healthy or maybe it's because you might be the last child to ever leave my womb but all I know is I'm so grateful to God to be your mom. You have a way of making everyone else around you smile. That toothless grin appeared days after you were born and it's only gotten bigger and more full of teeth ever since. And your laugh, oh, that laugh! How can we not laugh right along with you? Thank you for making those around you feel so much better. I always wondered how we were going to do it, your dad and I, raising three kids under the age of five. Most people thought we were crazy and many asked if you were a surprise. You were planned and my pregnancy was perfectly timed by God but having you around has surprised me. I'm surprised by how much I love having another child, and how your dad was right. Sweet child, thank you for being the most relaxed baby I've ever met. Your sisters have surprised me too. They don't like it when you pull their hair but boy, do they love having you around. The other day, you were standing next to Adeline by the fireplace and I was reminded that you could not have two better big sisters. They are full of boisterous activity, make believe worlds and opinions and you enjoy joining in on their fun, even if it's just crawling around their room. Thanks to them, you get to pull all the hair you want on their My Little Ponies and Barbie's. You've even claimed Adeline's red toothbrush and chase after Maralee every time she begins to run. I'm glad you've got not only big sisters but forever friends. When you went to daycare for the very first time, I didn't know if I could handle it. I've been through every single stage of mommy guilt but I've come to the conclusion that there is just no reason to compare your first year to the girls. They had completely different needs because of their prematurity and we were in a different season of life. It was a hard choice to be a working mom but I don't think you love me any less. Because you are the third child, you have had to go with the flow. You usually nap in your car seat and I still don't think we've fed you all your first fruits and vegetables. But, you've gotten to go to Auburn football games and Disney World and trips to the beach! Your life of adventure has started early and I hope you always see the world with eyes of wonder, ready to explore. You aren't walking yet but you sure are close. I've always known this time would come but I have to admit I haven't rushed you into mobility. I like to hold you and already miss nursing you. I want to protect you and keep you close. One of the hardest parts of being your mom is letting go. Yep, you are this mama's boy. I'm going to kiss those cheeks for as long as you let me and love you forever. I'll be your biggest cheerleader and always feed you your favorite meal. I'm already praying for the girl you will love one day and for the times when your heart is going to break. I hope you enjoy growing up as a farm boy and enjoy superheros and Star Wars as much as your dad does. One day I'm sure you are going to outgrow your sisters but somehow I know you will always love them with brotherly affection. The world awaits you, Ridley, and I know God's got great plans for your life. May the Lord bless you and keep you and always make his face shine upon you. There he sat, upright in his sisters' bedroom, with his eyes set on his toy a few feet away. It was one of those toys that has a little bell inside so when grabbed it jingles, making his eyes light up and the first efforts of words come out of his mouth in joyful glee. At nine months, he was learning that his hands and his legs could work together to get him places. I was positioned close to the toy, down on my hands and knees, smiling and reaching for him to move. "C,mon, Ridley! You can do it!" I encouraged him. He smiles back and believing me, drops his hands to the floor. He sits, half up and half in scoot position, testing the waters. Then he tries to move. He gets his right leg behind him on the ground but he can't figure out how to move the left one around back too. He sits, stuck for a moment but still making an effort to do this by himself. After another minute of trying, he sits back up. Even though he can't speak, his emotions are saying that he's flustered. He wants his toy but he just can't figure out a way to get it. Then he begins to think. "I want my toy. It's bright and shiny. And it makes noise! Why is my toy all the way over there? How come I can't get to it? I want my toy. Hmmm....how can I get it?" He looks up and with a smile begins to grunt. He sees me and my proximity to his toy. I'm still on my hands and knees and once more, I urge him to come. 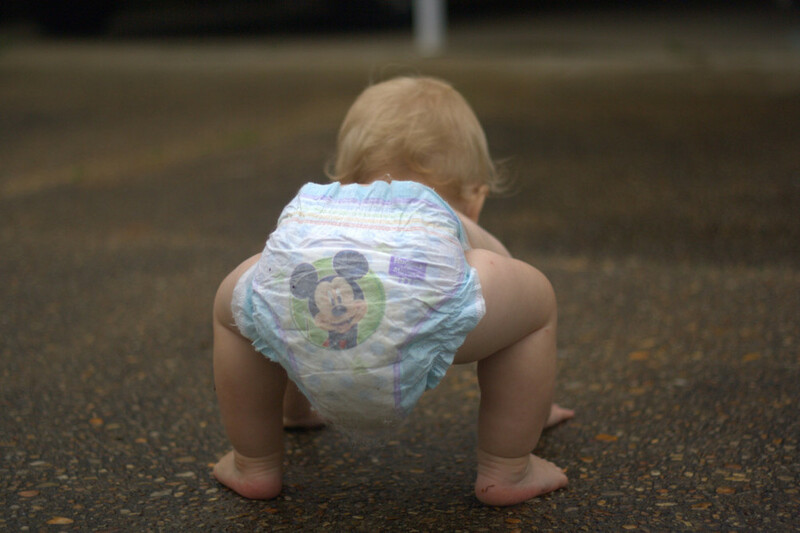 With a determined look on his face, he gets in the ready to crawl position. Then, one hand moves in front of the next. His chubby legs scoot his bottom across the hardwood floor. Now the other hand swings around front and he pushes his backside one more time. This is the most he's ever crawled. But he's still not made it to the toy. I could tell that was as far as he would get that day. Instead of making him try to do more than he could, I meet him halfway. I bring the toy closer just within reach of his squatty hands and with a big smile he reaches down and grabs it. Delighted, he pulls it in close and it jingles as he shakes it close to his mouth. Happy for him, I wrap him in my arms, give him a big kiss on his round little cheeks, and tell him how much I love him. Just as an infant develops into a toddler, spiritual maturity is developed through prayer. God teaches his children through prayer how to depend on him with our wants and needs. He knows what we want and if our desires come from a pure heart, he is going to help us. He will encourage us to make an effort on our part but through the process we realize our need for his help. This week, we've been focusing on praying hard. I know some of us are praying for healing, others praying for finances, relationships, and dreams yet to be accomplished. I don't want to ever mislead you into thinking that you will always get exactly what you want if you pray. But, as Lynn mentioned yesterday, Scripture continually tells us to trust in the Lord. Sometimes, like in Ridley's instance, I get exactly what I've asked God for. But the funny thing is, my prayers are answered in the most surprising of ways. They aren't answered in the way I've asked God to give them to me. God answers prayers on his terms, not mine. But when he does choose to answer those prayers, he wraps me up in his love and kisses my cheek. Just like the toy in Ridley's hands, he rewards me for being faithful. But (there's always a but, isn't there?) I still have prayers that have not been answered. As I'm developing in my prayer life, I'm learning that I have to keep praying hard for those prayers. Just because I don't see immediate results, doesn't mean that God will never provide the answer. He is continually teaching me to be patient and to not rely on my own performance. When I cry out to God to give me what I want, he stills my anxiety with his calming presence. It's like he's telling me, "Christen, I hear you. Be patient." My prayer for all of us this week is to believe that nothing is impossible with God but even if we don't get what we want (when we want it), that this will still be our mantra. May we hold on to hope and wait for his light to reveal the next step in our path. Let us not give up. And may we get down on our hands and knees to pray for all that our heart longs to receive. If you'd like to learn more about our New Year's Prayer Challenge, you can read this post about joining us for the next 21 Days. Follow along with the New Start 15 Bible Reading Plan.